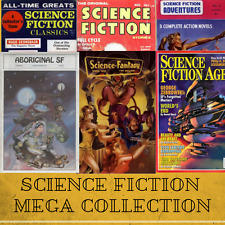 A huge collection of pulp science fiction magazines for every taste. Aboriginal Science Fiction Annual Anthology. Magazine Collection. Aboriginal Science Fiction. Aboriginal Science Fiction #01. Aboriginal Science Fiction #02. The Prisoner. Very first issue of this quarterly magazine which ceased publication in 1989. Rare - I've not seen this very first issue available anywhere else. Small corner crease top right, age-normal page-edge yellowing. GREAT COLLECTORS I TEM IN FAIR CONDITION FOR THE YEAR USED. 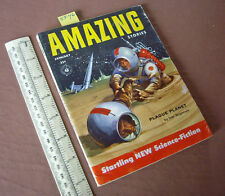 IF - SF PB Vintage Digest V1#7 UK Ed 1950s era 1/6 Price. Classic Robot Cover. 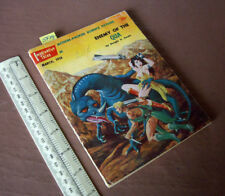 IF - SF PB Digest V1#7 UK Ed 1950s era 1/6 Price. Great Robot Cover. Published mid 1950s era by Strato, Leicester, England. Your choice. Condition: Very fine complete and original condition with only minimal signs of age and use. Your choice. Otherwise, very fine complete and original condition with only minimal signs of age and use. Imaginative Tales USA SF Digest Mag. March 1956. Classic Alien Dragon Cover Art (SF14). Your choice. Condition: Very fine complete and original condition with only minimal signs of age and use. Your choice. Condition: Very fine complete and original condition with only minimal signs of age and use. Of Godlike Power, by Mack Reynolds. Worlds of Tomorrow science fiction magazine, September 1965. Editorial, by Frederik Pohl. Theories Wanted, by Robert S. Richardson. 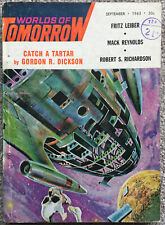 Science Feature Catch a Tartar, by Gordon R. Dickson. Scarfe's World, by Briwn W. Aldiss. World of Ptavvs, by Larry Niven. Worlds of Tomorrow science fiction magazine, March 1965. Undersea Weapons Tomorrow, by Joseph Wesley. This copy shows only light signs of age. Space Adventures (Classics) - No.9 - Winter 1970 - Don Wilcox, etc. Space Adventures (Classics) - US Digest – Number 9 (continuing the numbering from Science Fiction Classics) – Winter (January) 1970 – 130 pages. Editor: Sol Cohen - Publisher: Ultimate Publishing Co., Inc. - Cover: Julian S. Krupa and Leo Morey (reprinted from Amazing, August 1940). 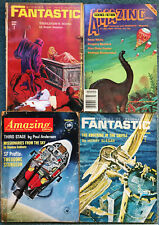 Four Classic Science Fiction Magazines, Amazing and Fantastic, 1962 to 1983. 2 x Fantastic Stories of Imagination;1 x Amazing Stories; 1 x Amazing Stories combined with Fantastic. Amazing Stories, February 1962. Amazing Stories combined with Fantastic, May 1983. Classic science fiction in 50-year-old magazines. Condition: Very fine complete and original condition with only minimal signs of age and use. Science Fiction Adventure Classics – US digest – September 1972 - Issue #20 - 130 pages. Publisher: Ultimate Publishing Co., Inc. - Editor: Sol Cohen – Cover: Malcolm Smith, cover art is an adaptation of the cover for Amazing Stories, September 1946. Imaginative Tales USA SF Digest Mag. Classic Blast-an-Alien Cover Art. Your choice. Condition: Very fine complete and original condition with only minimal signs of age and use. Science Fiction Adventures Classics – US Digest – November 1973 – Issue #27 – 130 pages. 33 Voice from a Star (1947) - short story by William P. McGivern. 66 Miner Crisis on Io (1947) - short story by Chester S. Geier [as by Guy Archette ].